Awkward or eerily practical? The 65th Lincoln (Wis.) High School reunion will be held at a funeral home's gathering center in Manitowoc, Wis.
We first saw the news over at Jim Romenesko's media blog. Barbara Luhring, a daughter of a member of the class of 1948, wrote in and said that her first reaction was "astonishment." But the more she thought about it, the more it made sense. Her mom, Alice Baryenbruch, told Today.com that she didn't mind the setting. "I'm familiar with funeral homes at this age so it doesn't seem weird at all," Baryenbruch, 82, said. "As long as I can have an Old Fashioned, it doesn't matter where the reunion is. I'm looking forward to the door prizes." Gerry and Germaine Waak are organizing the event. Germaine told Today.com, "When my husband was looking for locations and came home and told me he went there, I said, ‘You went where? !’"
She's since changed her tune after visiting the venue. Germaine told Today.com that when she tells classmates about the reunion, the reactions are usually the same. But then she explains, "No, it's done beautifully. 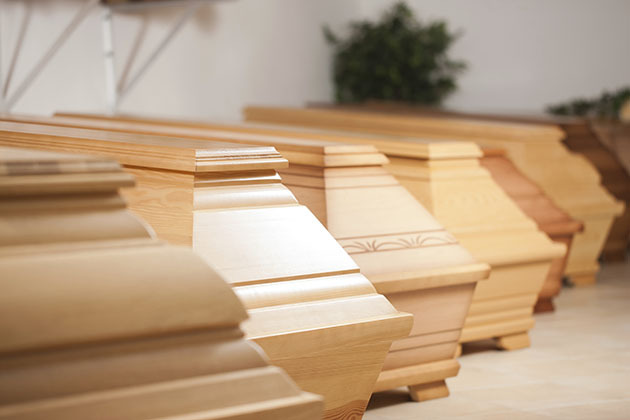 You don't feel as if you're walking in there and have the feel of any part of a funeral home." Andrew Harrigan, part owner of the Harrigan Parkside, said, "It's tough to explain to people. Initially people have a level of apprehension, but once they walk in, it's never been an issue. They see the way it's set up and the atmosphere within, and it’s always gone very well." The funeral home management has pledged not to hold any services on the day of the July reunion. There will be a cash bar. We're guessing nobody's gonna get carded.